Home | New Releases | Alex Ross Limited Edition Fine Art Giclee Print on Canvas:"Marvelocity: Doctor Strange"
Alex Ross Limited Edition Fine Art Giclee Print on Canvas:"Marvelocity: Doctor Strange"
"Marvelocity: Doctor Strange" is part of a series of prints featuring artwork from the new Marvelocity book. The first 4 images include Captain America, Spider-Man, Iron Man, and Doctor Strange. Editions 1-50 and AP/PPs 1-15 are reserved as matched sets. Each print is signed by Alex Ross. 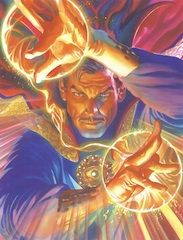 Home | Disney and Animation Art | Alex Ross | Super Hero Animation Art | Alex Ross Limited Edition Fine Art Giclee Print on Canvas:"Marvelocity: Doctor Strange"